Learn to fly in Texas. first class weather service and traffic control. Add favorable weather conditions and you have the perfect combination to get your private pilot certificate in a shorter time and at much lower costs than in Central Europe. 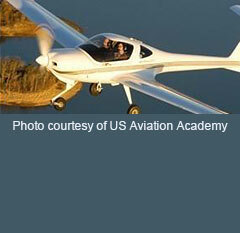 US Aviation Academy (www.USAviationAcademy.com) with two locations (both farther south than any Mediterrean island) offers you all of the above. You are trained here from the very beginning according to professional standards. Should you dream of becoming an airline pilot, you would have the best basic training. Even if you want to fly just for your own needs, the qualifications of the school are a guarantee of high safety standards and best equipment. Assistance with the TSA security check is provided. (Since 2004 all Non-U.S. Citizens seeking training at U.S. flight schools are subject to a security check by the Transportation Security Administration, www.flightschoolcandidates.gov/afsp2/?acct_type=c§ion=WN, follow the link Legislation). Practical organization of your stay in Texas (Denton or Sherman) in all details through a direct connection with the flight school. Professional help for your ground and flight training: Take some introductory lessons, learn the basic principles of flying directly in American English, train in Aviation English with an experienced FAA instructor in Germany.